Since they began to realize how much the subway system had been damaged by the storm surge from Hurricane Sandy, leaders have been making statements like this one from Governor Cuomo: "We will rebuild the subway system and it will be better than before." Tonight Stephen Smith scoffed at that claim, but I think it's important to take it seriously, and to think about what it could mean. It is often said that the Chinese word for "crisis" is spelled with the characters for "danger" and "opportunity." It's also been pointed out that this is a crock, so let me give you a better metaphor, one that a friend once learned from a plumber: if you have a small leak in a pipe in a wall, it's better to wait for it to bust than to fix it right away. The reason is that either way you need to tear out the wall. You might as well wait until it ruins the wall by itself. Obviously this is not always the best course of action; the busted pipe could ruin some valuable papers or equipment, but it seems relevant to our current situation. We don't know the full extent of the damage to New York's transit system. 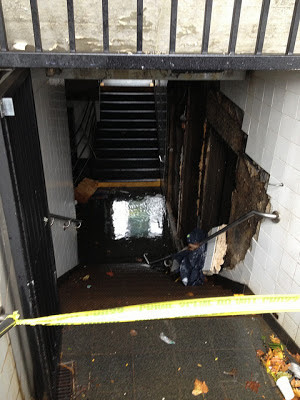 We know that the Cranberry Street (A/C) tunnel is still flooded, and that the Rutgers Street (F) and Steinway (7) tunnels are not in great shape. We know that almost all of the PATH system was heavily flooded. We also know that there have been washouts along the Northeast Corridor between Newark and Secaucus, and in other parts of the commuter rail system. Let's look at this as an opportunity, like a really long Fastrack: if you could rip out a section of the subway or commuter rail system and replace it, with 90% federal funding, what would you improve? Obviously, some parts, like Hoboken Terminal, were recently renovated and it's just be nice to have them back the way they were. Others, like the South Ferry station, are brand new and have never worked very well, and we'd just like them working. But some parts were kind of old and decrepit to begin with. The PATH train tunnels are very narrow and twisty. This constrains the Port Authority to use short, narrow train cars. Could the tunnels be widened and the curves smoothed out, to the point where they could handle bigger cars? Many signals will probably need to be replaced. Why not replace them with signals compatible with the new Communications-based Train Control system that the MTA is planning on installing at some point anyway? This is particularly relevant in the Steinway Tunnel, which is supposed to host the next line to receive CBTC. The Port Authority had already planned to install CBTC and Automatic Train Control in the PATH system by 2015; could that happen sooner? Some of the stations were in really bad shape, like the G train station at 21st Street/Van Alst. It'd be nice to see them rebuilt. Messing with the tunnels themselves is highly unlikely. The water almost certainly won't damage those, and the Downtown PATH tunnels were actually completely flooded for weeks after 9/11 with little ill effect on the tunnel structure itself. Signal upgrades are a little more likely, and this might be a cause for an accelerated program of replacing interlockings, but designing and making the key parts still takes weeks to months. There was a fire at Bergen Street tower that took out all that stuff, and it was quite a while before the installed the replacement gear. And piecemeal upgrades to prepare for CBTC don't really make sense, because CBTC works in a completely different way from the regular signal system and is much more heavily reliant on a central computer and a wifi-like network that connects it to all the trains, so that they can tell the computer where they are and it can tell them how fast they can go. At best, they can use the long closure of the Steinway Tunnel to install the CBTC antenna cable all in one go rather than subjecting passengers to many weekends of closures to do it piece by piece. In terms of actual feasible improvements I'd like to see, I think they should remove or at least relax the grade timer signals through the tunnels, and let the trains run as fast as they can go. If Philly can run 70 mph express trains on Broad Street, why can't NYC at least let trains hit 40 going downhill in the tunnels? Doing CBTC on the PATH might make sense if things are as bad as they sound. Doubt it makes sense to do it on the tunnels under the East River unless there is a definite plan to do the rest of the system and vehicles. If you put it in now but don't do the rest for another 10 years, it'll be obsolete. Generic second to the suggestion of CBTC-related signals upgrades. Actual structural changes don't seem like they could be accomplished in the timeframe you're thinking of. Throwing Long Branch-Bay Head electrification into the inevitable federal spending supplement might be a nice shot in the arm for an area that has it much worse than no lights and skeletal subways, but that's a thought for later. The G is flooded at Newtown Creek. The MTA should clear tracks of litter and sweep the stations, at the very least. In the time frame that they're given, they could also probably give stations a new coat of paint. It looks like a good deal of subway service will be restored by Monday, but if the subways were down for longer, they could do the work in the Steinway tunnels and start top-down station rehabs in the non-rehabbed stations, starting with Chambers St on the J/Z and West 4th.